The National APIDA Panhellenic Association (NAPA) serves to advocate the needs of its member organizations and provides a forum to share ideas and resources within its members. NAPA supports the development of positive relations through open communication with interfraternal partners to enrich the fraternal experience. NAPA organizations set the gold standard for APIDA fraternities and sororities. In addition to meeting the association’s base standards, NAPA member organizations are exposed to resources and expertise to help them continually improve and be the best they can be. Universities, Greek Councils, and students want the best APIDA fraternities and sororities on campus and they can find them in NAPA. Having recently celebrated its 10th anniversary at the 2016 Association of Fraternity/Sorority Advisors (AFA) Annual Meeting, NAPA has doubled in size in just a decade. What started as an alliance of nine chartering constituent organizations flourished to a coalition of 18 APIDA fraternities and sororities. To continue fostering a spirit of excellence and growth, NAPA is organizing its inaugural awards program to recognize individuals, councils, and organizations who continue to advance NAPA’s mission and vision. Change Agent of the Year: Recognizing an individual committed to social justice. Professional of the Year: Recognizing an alumnus who has received acclaim in industry. Advisor of the Year: Recognizing a supportive university faculty/staff advocate. NAPA Volunteer of the Year: Recognizing an individual who has advanced NAPA as a whole. Undergraduate of the Year: Recognizing an undergraduate member who advances the NAPA/fraternity community on campus. Outstanding University Council: Recognizing a university council that embodies interfraternal unity and demonstrates inclusivity in supporting the NAPA open expansion policy. Outstanding Philanthropic Programming: Recognizing an outstanding philanthropic initiative. Outstanding Educational Programming: Recognizing an outstanding educational initiative. Outstanding Cultural Programming: Recognizing an outstanding cultural initiative. Alumni Initiative of the Year: Recognizing an innovative event or activity that mobilizes NAPA alumni to answer a call to action. Social Media Campaign of the Year: Recognizing an exceptionally polished and persuasive marketing campaign by a NAPA organization. Collaboration of the Year: Recognizing a partnership or collaboration between 2 or more NAPA organizations. Nominators may submit a maximum of 10 nominations per award category. The deadline to submit all nominations is November 1, 2017 at 11:59 pm EST. Nominators are highly encouraged to attach supplemental documentation (i.e., letters of recommendation, photos, links to press and video) to accompany their application. Nominators do not need to be registered for the AFA Annual Meeting or NAPA Annual Meeting to submit an award application. Nominators may nominate themselves, their council, their organization, or others affiliated with the NAPA community. All applications will be reviewed by an assessment committee comprising of volunteers from the greater fraternal community. All award recipients will be featured in a forthcoming NAPA press release, website article, and social media post across Facebook, Twitter, and Instagram. Award recipients will be honored at an AFA-sponsored awards reception during the 2017 NAPA Annual Meeting. Winning individual award recipients will be notified of their status by November 15th and are encouraged to prepare brief remarks to share at the NAPA awards reception at AFA AM 2017. Currently seeking volunteers! 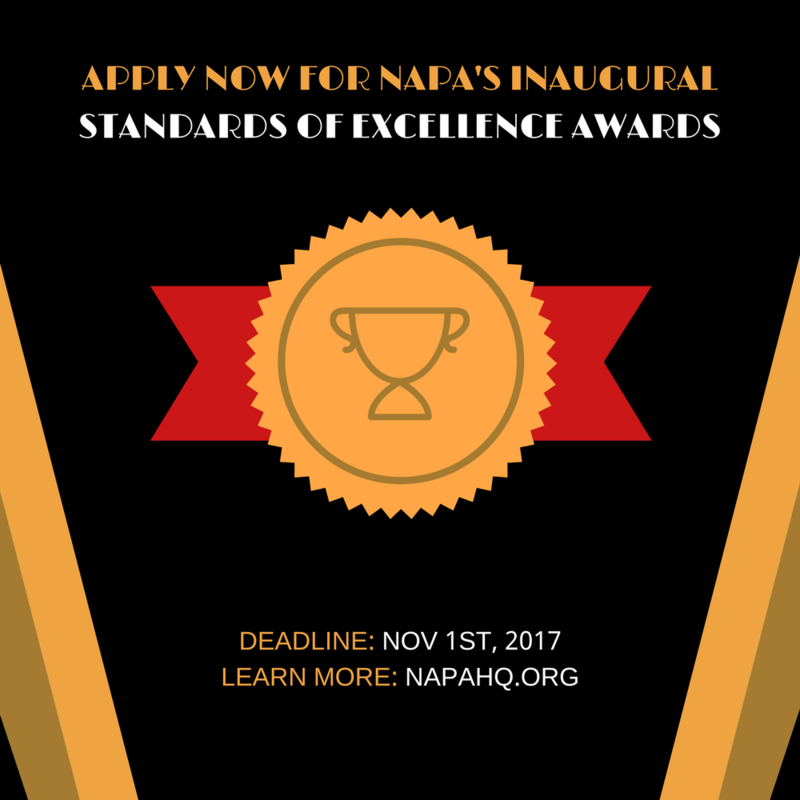 If you are interested in reviewing and scoring award submissions, please contact Bryan Dosono (membership@napa-online.org).